SilkAir (Singapore) Pte Ltd is a Singapore based airline and entirely owned by Singapore Airlines. The airline operates scheduled international flight services to over 26 cities throughout Southeast Asia, South Asia and China. Being the regional wing of SIA (Singapore Airlines), SilkAir served a total of 29 short haul destinations within the SIA group network. 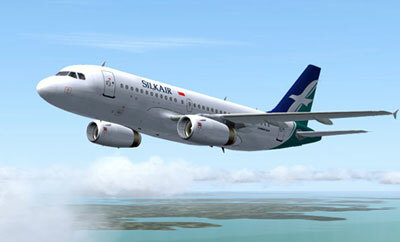 SilkAir's passenger fleet include aircraft models of mainly Airbus (A319 and A320). For a complete list of SilkAir offices throughout Asia Pacific region for addresses and contact information details. For booking of SilkAir Free and Easy Packages for your holidays. When it comes to dining, SilkAir will offer you both oriental and western meal menus and is emphasised primarily around the region's flavours. SilkAir's in flight entertainment services relies on the DigEplayer handheld device. Economy class passengers will have to rent the DigEplayer for a fee while Business Class passengers enjoys the device as a complimentary for selected flight routes. Check flight schedule, flight status directly from SilkAir official website. You can also check on the cheapest airfare, flight schedule, flight status, airlines offices, contact number, airlines packages, air cargo partners, air ticket prices and booking procedure, international airfares, frequent flyer and other flight information and travel deals and packages. When you are making an airfare booking, select from either economy airfares, business class airfares or first class airfares whichever you prefer. Have a pleasant flight journey and enjoy your holidays or business trip! Want to book the cheapest SilkAir flight for your holidays? Start your air ticket search below. Our travel partner will search and compare more than 700 airline travel sites and online flight ticketing agents and offer you the best deal. Enter departure and arrival city and corresponding dates below to search, as well as total no of passengers and cabin class type. For SilkAir flights, just simply go under Airlines menu at the left hand column of the results page and only select SilkAir in order to show only that particular airline flights only and you can continue with your air ticket booking. Travel Note : You may or may not get the cheapest flight deal on the selected airline depending on the flight route. Other airlines may offer cheaper flights.